Fashion designer Stella McCartney is backing a report by the Ellen MacArthur Foundation which claims half of High Street fashion is disposed of within a year. "Today's textile industry is built on an outdated linear, take-make-dispose model and is hugely wasteful and polluting," said Dame Ellen MacArthur, and the Foundation's report backs this up. Twice as much clothing is being produced as 15 years ago, but we're wearing it 4/5ths as much; and half of the clothes sent for landfill in the UK could be recycled, it claims. Phase out substances of concern and microfibre release. 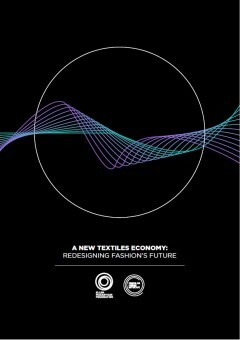 Increase clothing utilisation: Transform the way clothes are designed, sold, and used to break free from their increasingly disposable nature. Radically improve recycling: Transform clothing design, collection and reprocessing. According to a BBC news item, Stella McCartney said: "What really excites me about [the report] is that it provides solutions to an industry that is incredibly wasteful and harmful to the environment." And we at Uniform Reuse would add: don't ignore the huge corporatewear sector! Look at how corporatewear could be designed to last longer, have less environmental impact while being used, and be de-branded for reuse when no longer required by the first user. Download the report from the Ellen MacArthur Foundation website, via the External Link below. Electrolux are holding national Care Excellence Day on 19th October in Luton.